A 30-second television spot at this year’s Oscars costed $2million and a hotel chain was already one of the major sponsors of the event, so how did Airbnb become the most engaged with brand without spending a penny on TV? What looked to be a problem soon became their success, as their real-time strategy gained ongoing conversation amongst movie fans across the globe, including some major celebrities and brands. The #LiveintheMovies Twitter campaign earned a sizeable amount of earned media coverage too, and picked up a Silver in the Mobile category at this year’s Cannes Lions. Audiense: With Airbnb very much 'out' of the Oscars, why was it so important to get the brand in? Luhr: "Anytime you’re talking about a single moment with tens of millions of viewers, the cultural gravity will attract brands. The Oscars is also one of the biggest social nights of the year (Ellen’s selfie is still the most retweeted tweet ever.) But for us, it was about more than eyeballs. In the Oscars we saw a chance to add to the Oscars conversation in a way only Airbnb could. Movies create immersive story worlds that draw us in and capture our imaginations. Our idea was to use Airbnb listing to connect these movie worlds to the real world. 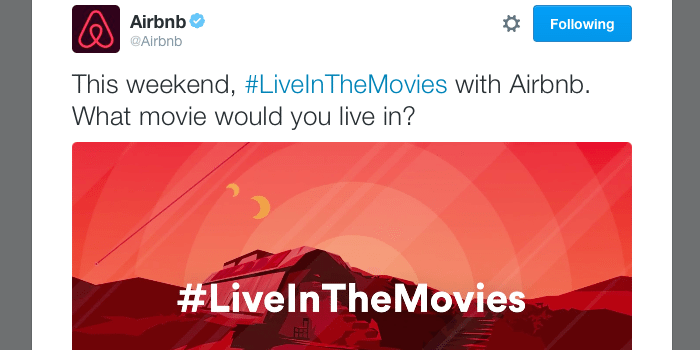 So #LiveintheMovies was a way for us to activate a big brand idea against a relevant cultural backdrop." How did you work with Airbnb in order to deliver relevant social content about their properties in real time? "Tight collaboration. During Oscars weekend we had an integrated team in one room at Airbnb HQ. So many moving parts meant everyone had a specific role - we had people fielding twitter responses, sifting through Airbnbs to find the perfect movie matches, writing and designing assets on the spot, and of course watching the Oscars for opportunities. To an outsider it would have been difficult to tell who worked where." This campaign reached an audience outside of Airbnb's immediate community, how did you analyse this audience? "Today people watch The Oscars with their heads up and their heads down - look up to the TV and see a big moment, look down at your phone to see what people are saying about it. So we worked closely with Twitter to develop an audience profile that not only resembled Airbnb’s target, but who were also likely to be watching and tweeting. So when viewers did look down they were sure to see our question: If you could live in any movie what would it be?" This campaign did a lot of things that aren't possible through traditional channels. What does this mean for the relationship between traditional media and social media, given that social has the ability to subvert it? "In many ways the success of this campaign was driven by the fact that Airbnb didn’t have an Oscars ad. That said as long as people want to watch, there will still be opportunity for traditional media. Just as long as people want to talk about it, there will be opportunity for social. An alternative distinction might be the way we’re using these channels - no matter the medium, are we adding to the Oscars viewing experience or just latching onto it?" Does being a relatively new, fresh brand give Airbnb an edge when it comes to attempting more organic campaigns like this? "Being a culturally relevant brand certainly affords some advantages, but especially with participation-based ideas like this one, if it’s not interesting it’s invisible." 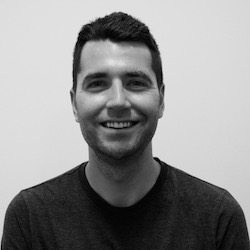 What were some of the best results of this campaign, and why were these important? "Without a TV spot, Airbnb managed to become the most engaged with brand during the Oscars. Generating this type of active interaction at scale speaks again to #LiveInTheMovies as an example of creating culture instead of just chasing it. Oh and Adrianna Huffington participated, that was pretty cool too." Want to hear more insights and opinions from digital marketing and social media professionals at some of the world’s top brands and organisations? Check out the other social media interviews in our Spotlight Series, including NASA, Microsoft, United Nations, Pizza Express, and many more. ← Water Wipes Promotes With #PureLove While Holiday Inn Asks #WhyOverpay?